And that is why I came to Judge O’Donnell in the first place. Over the years of living here in Georgetown and knowing who he was, meeting and speaking with him, even appearing before him, I have found he has the most delightful sense of humor. If nothing else, Judge O’Donnell is one of the funniest men in town. We talked a little bit about him growing up as a preacher’s son. He moved around some as his father’s position in the church led him to different places. “You know they say preacher’s children are the worst,” I commented off handedly. Although he’s a judge, and a lawyer, we did try to avoid talking about his job with very little success. He says he has truly enjoyed his career and talked lightly of different subjects that were a bit comical. “Did they ever catch him?” I asked laughing as he told the story. We talked about he recusing himself of the bench and he conceded he’s had to do that in the past. 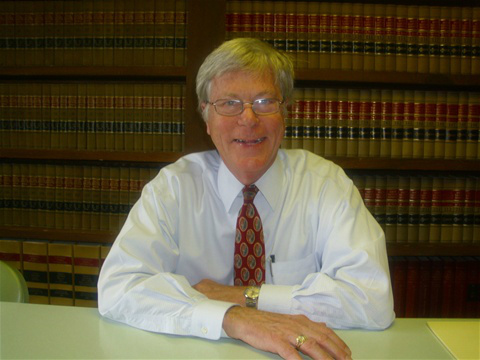 Being a judge and resident in this small town for almost 40 years though makes it difficult for him to recuse himself of many cases. If he doesn’t know the people, the people certainly know him. Under the circumstances though, he limits himself to family and people close to him so as to avoid any personal feelings on either side. “They were falling asleep during court?” I asked kind of surprised. “I can tell you a story that’s kind of cute,” he offered. “Okay, tell me a cute story then.” I wasn’t disappointed in my anticipations either. “I believe that just made my blog,” I announced laughing. As I said, he was a real pleasure to sit down and talk with. I thank him appreciatively for participating in the People Of Georgetown segment of my blog. It wouldn’t be the same without him and Georgetown wouldn’t be the same without Judge Robbie O’Donnell either.